You can set a basic color scheme for your site with one click. 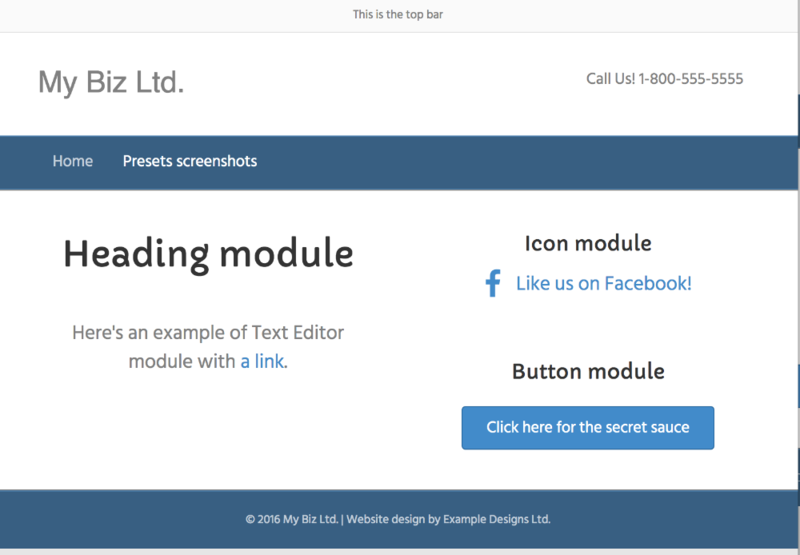 Selecting a preset configures many of the settings in Customizer automatically to follow the preset color scheme, but you can customize any or all of them, by selecting the other tabs and adding your own settings. This article contains a description of each preset. Note: Changing a preset can delete other Customizer settings you have made. See the Related Links for tips on how to choose presets and troubleshooting tips. Full-width layout with all-white backgrounds, grey text, and a blue accent color. 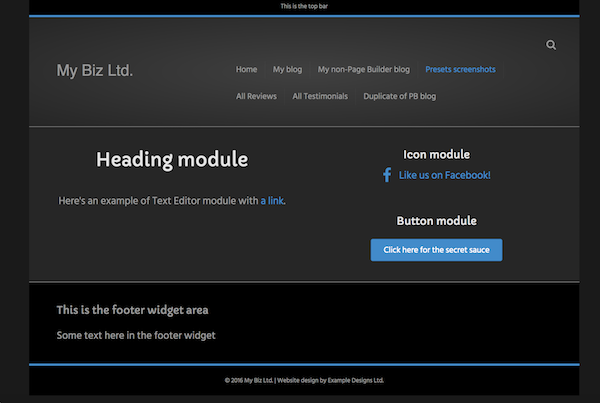 Full-width layout in which header and footer areas are nearly black. Accent color and content headings are lime green. The box applies to the entire page, from the top bar down to the footer. The nav bar and accent color are a royal purple. Other areas of the page have a white background. 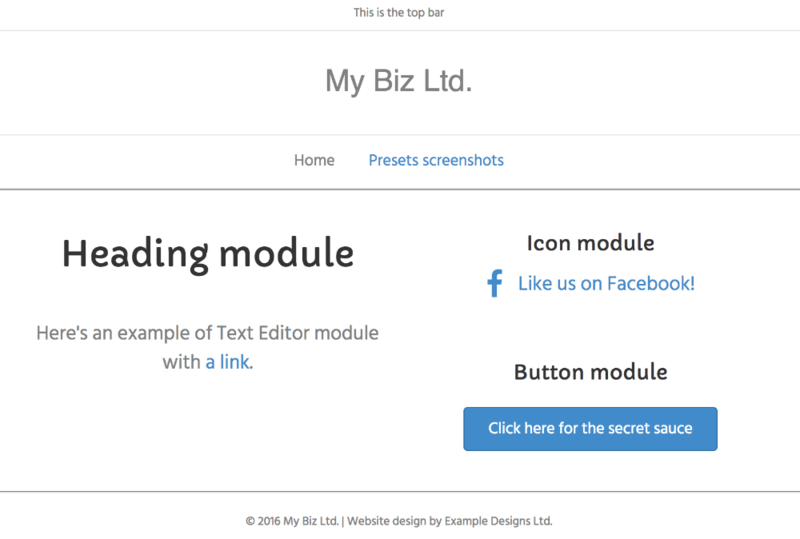 The box applies to the entire page, from top bar down to footer. 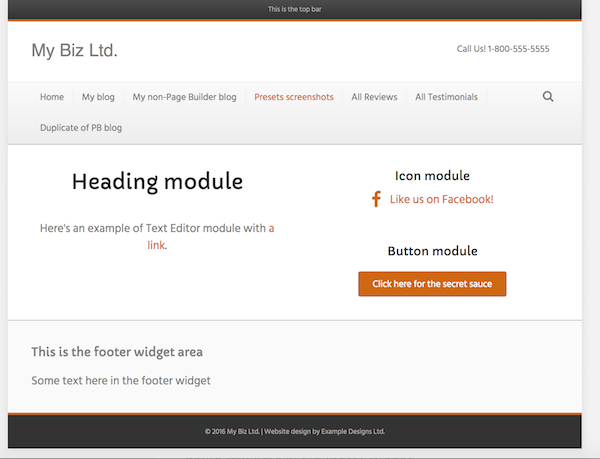 There is a dark top bar and footer and grey header, nav bar, and footer widget area, plus a dark orange accent color. The top bar bottom border and footer top border are ln the accent color and are controlled by Customize > General > Accent Color. A full-width layout with a triad of teal colors for top bar, header, nav bar, footer, and accent color. 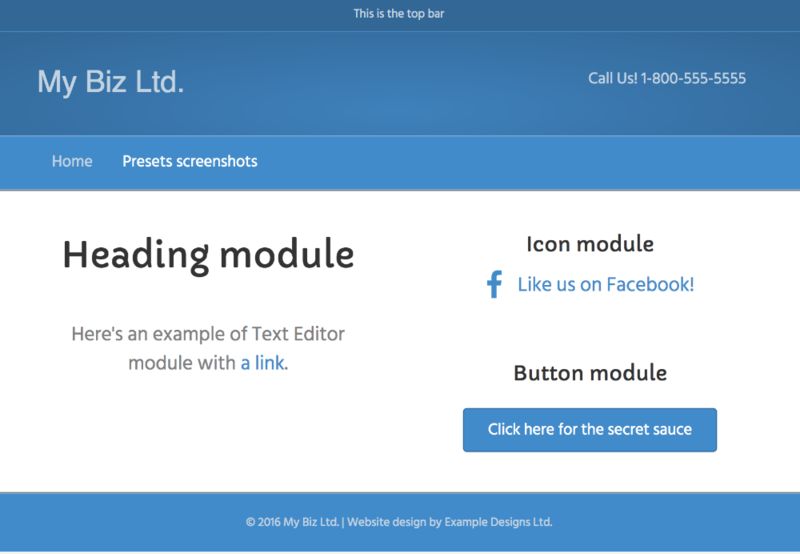 A full-width layout with a navy blue nav bar and footer, an off-white top bar and footer widget area, and blue accent color. This preset has a combination of a boxed content area and nav bar with the rest of the header and footer components full width. There is a layered color "sandwich," with a blue-grey top bar and footer, an off-black header and footer widget area, a dark grey nav area, and a blue grey accent color. 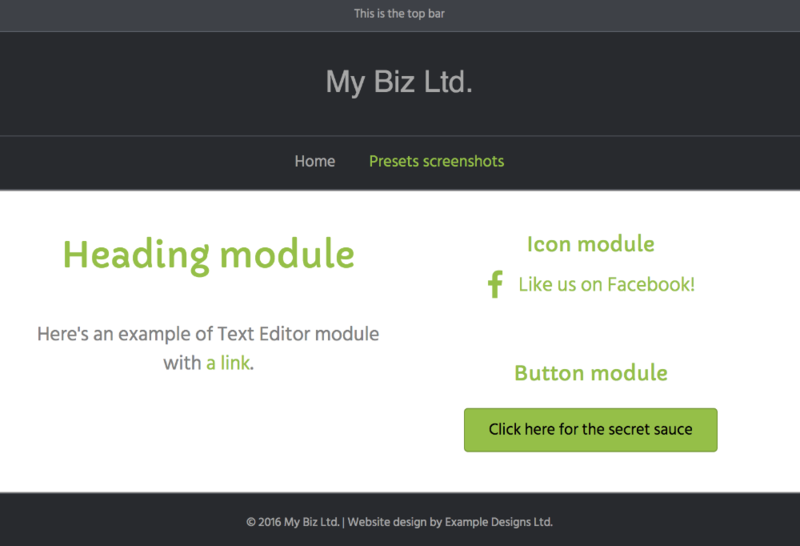 Layout: boxed nav bar and content area; other header and footer components are full width. See the Related Articles for how to make this preset entirely full width. 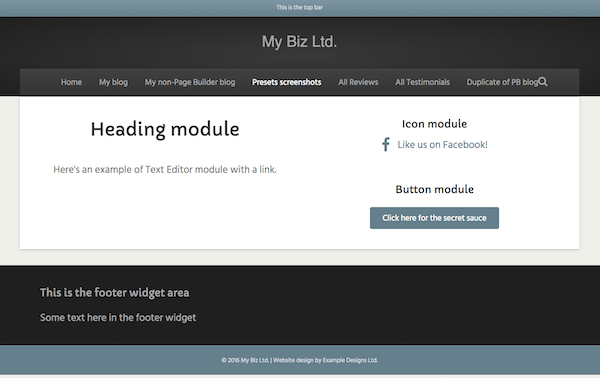 This preset has a combination of a full-width header and footer with a boxed content area. 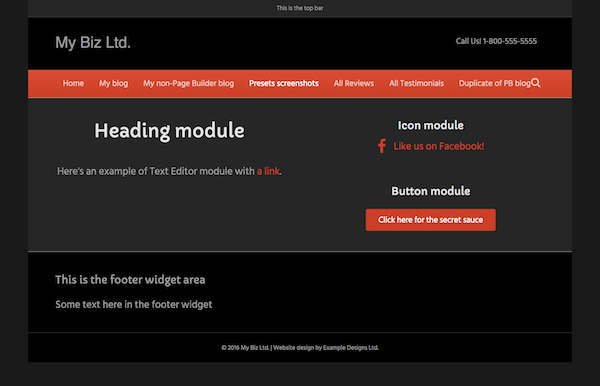 The top bar, footer widget area, and footer are black, with a dark grey header and page background. The nav bar and accent color are green. The dark background around the content box disappears as the screen is sized smaller. 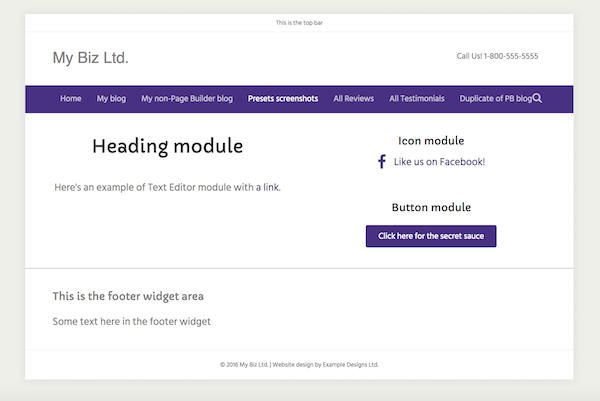 Layout: Full-width header and footer with a boxed content area. 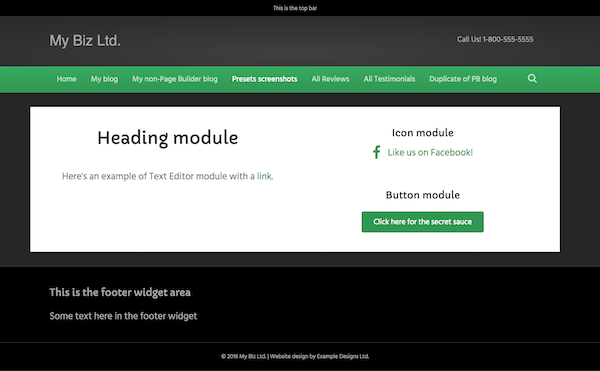 See the Related Articles for how to make this preset entirely full width. This is a boxed preset. The entire page except for the nav bar and accent color is shades of black and grey, including the page background outside the box. This is a boxed preset. The entire page except for the accent color is shades of black and grey, including the page background outside the box.